One of the injured boys landed on a parked car, while the other landed on asphalt. Both children, ages 5 and 6, were seriously injured, and taken to the Albany Medical Center. The boys were around 15 feet off the ground when they fell out of the bounce house, according to local media, citing witnesses. The third child in the bounce house, a 10-year-old girl, only suffered minor scrapes and bruises. Local police said the bounce house was staked to the ground, but that the wind managed to pull the stakes out, and lift the structure into the air. Although it sounds like a freak occurrence, similar incidents have happened many times before. Last month, five bounce houses were swept away by a gust of wind in Valencia, Spain, leaving 26 people injured. And February 2011, two girls — ages 7 and 10 — were playing inside a bounce house when it also flew into the air in Tuscon, Arizona. 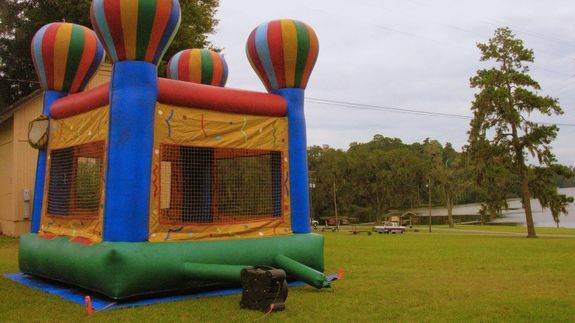 Later that same year in Tuscon, a dust devil blew away a bounce house — the third time such an event happened in Arizona in 2011. Luckily, in that case, kids playing inside got out just in time, and no one was hurt.